Wow! This is a really cool pic! Wow, I love how crisp this picture is! I feel as if I am there. You can tell he has amazing eyes even in B&W. Beautiful! Neat pic. His eyes are fabulous. so rich and contrasty… perfect! That background really adds to the drama. Love it! Great picture. His eyes are beautiful. Wow, great image! Love the contrast and the cornfield adds so much to the image! Fabulous, the lighting on his face is awesome!!! Lovely light and framing. wonderful black and white. Wow look at those eyes. Gorgeous! Oh very nice! I like this pic! 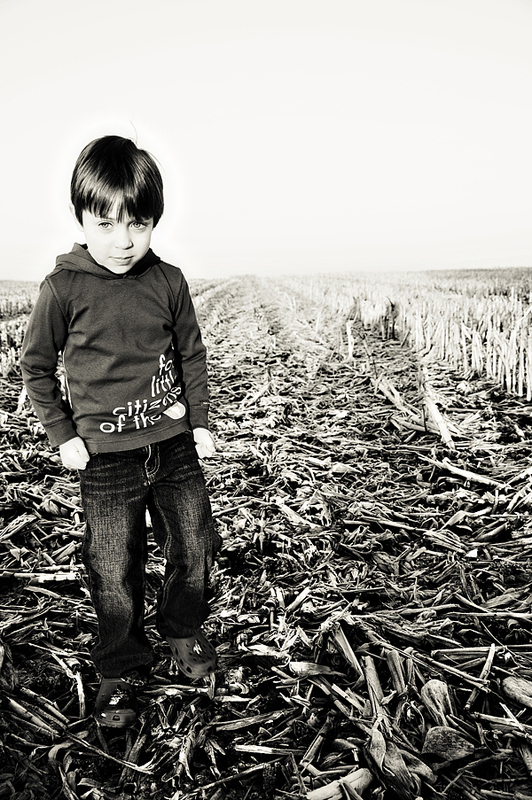 His moody “tough” face totally matches the “starkness” of the cornfield…awesome!